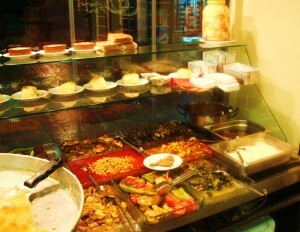 When planning my trip to Istanbul I envisioned eating the Turks’ version of soul food. I read this article: Pera Sisore: Black Sea Magic on the Istanbul Eats website, and it convinced me that indeed, good soul food can be found in Turkey. I’m not sure the owner of Pera Sisore isn’t from Tuscaloosa or maybe Birmingham. He has this casual, tweed style: corduroy blazers with elbow patches, nice loafers, pony tail pulled back-that has me envisioning him in front of a Southern Lit class on a Magnolia-scented campus in the American South. And while his steam line looks like it’s straight out of a meat and three in Alabama, the flavors are like a quick circuit through the Junior League of Tupelo or perhaps Vicksburg. I ask for an az platter [a plate with a bit of several items] and am rewarded with a few meatballs, a bowl of spinach, some meaty dolmas, fried hamsi, a bowl of greens with hominy and a few big red beans and a ripe tomato. A hunk of charred homemade bread from the wood-burning oven in the back of the restaurant rounds off the affair. I haven’t had a tomato this good outside a summers day in Grainger County, Tennessee. Pera Sisore must have a country hoss in their kitchen I reckon. I’m guessing they hog tied an ol’ boy from Mississippi or Alabama and converted him into their big city cook. I haven’t seen a lot of Baptist churches in Istanbul so I don’t know where he goes on Sunday but through the week he’s bringing the Deep South to the Beyoglu. When I show the captain at my hotel the address for Pera Sisore he rolls his eyes skyward and taking me by the arm, proceeds to walk me 15 minutes down some seriously byzantine alleys to their doorstep in Asmalimescit. I could’ve whittled a lot more restaurants in town off my wish list had it not been for Pera Sisore. I end up eating here 4 times in 13 days and never have a bad meal. Sure the cornbread could use some work, it’s dry, but when you’re weaned on cornbread from a cast iron skillet rich with bacon fat and the love of an elderly mountain woman, anything else becomes a lesser version. I admit, I have not been to this blog in a very long time. but it was yet another joy to see your great articles.